Elsa is clearly a very sweet sort of cat — and she's putting that big heart of hers to some good use. After a pair of chicks hatched on the farm where she lives in western Sweden this week, Elsa leapt into mom-mode. All it took was the sound of the baby chickens, who up until then had been inside an artificial incubator, calling out for a little parental guidance. "She was walking around meowing last night, and honestly being a right pain, when she heard them chirp," Elsa's owner Ingela Ljung told TheLocal.se. "I am also scared that she will be completely devastated if I take them from her," she said. 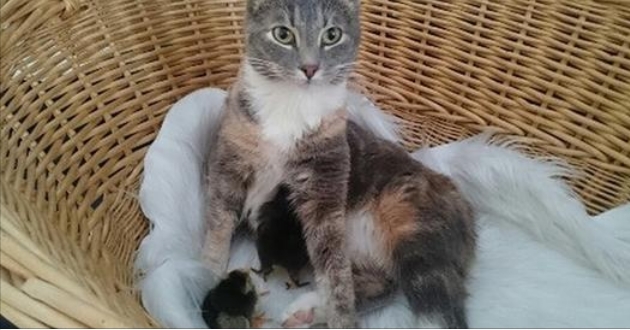 Responses to "Cat Hears Newborn Chicks Chirping And Decides To Be Their Mom"